I was in Amsterdam for a break recently. Just off one of Amsterdam’s busiest streets, the Kalvestraat, is the Begijnhof which was originally a beguinage and is one of the oldest parts of the city. To this day it houses both a Roman Catholic and an ‘English Reformed’ church. The latter is also a Church of Scotland. We discovered the Begijnhof on a previous visit to Amsterdam quite by chance and sought it out once again on this visit. The city’s oldest house is here – the Houten Huys 34 Begijnhof, the black timber building photographed here by my daughter. This is the small but ornate chapel in the Begijnhof. And the rather more plain kirk. I’m not religious in the least but there is a need for places like this in a bustling city and I can’t deny the presence of some kind of spiritual calm in the Begijnhof. It is incredible that the Kalverstraat with all its trams, cars, people, barrel organs, buskers and the like is a mere few yards away. And yet the only sounds in the Begijnhof are the respectful hushed tones of the visitors and birdsong. If my understanding was right, I think they would, for a small fee, (50 cents I think) dedicate a candle and say a prayer for a departed loved one. A nice gesture if you believe in that kind of thing and pretty businesslike given the amount of visitors and the costs of keeping the building. This pocket watch belonged to Robert Burns. It was a gift from his wife, Jean Armour. A SYMBOL of one of literary history’s most famous romances, a watch given to Scotland’s greatest poet, Robert Burns, by his wife Jean Armour, has been uncovered and is to go on public sale for the first time. The silver pocket watch contains a delicate, hand-annotated love note written by Armour on a piece of paper hidden inside the case. The “pair-cased” watch contains a hand-pierced paper insert with a twin love-bird and heart motifs, and the initials “R” and “J” inside them – which experts believe refer to Rabbie and Jean. On the back of the watch, which experts say is in excellent condition, the words “Robt Burns Mauchline” and the date 1786 are engraved. Phil Gregory, spokesman for the auctioneer Lyon & Turnbull, said the watch came from a private collection and the seller had opted to remain anonymous. He said: “I’ve held the piece myself, and it’s in amazing condition. You would not have thought it was the age it is. The rest of the article can be read by clicking on the link. The watch came up at auction in Edinburgh today and was expected to reach a price of £2,500. I remember it well. In fact it is one of my earliest memories. I was playing some game, not sure if I was a cowboy or a spaceman but it involved jumping off the couch and landing on a wicker chair nearby. The wicker chair was too light, overbalanced and I ended up on the floor minus one of my front teeth. As my mother comforted me and with a towel at my mouth to stem the blood I can clearly recall the images coming through from Dallas on our recently inherited black and white TV. It was of American cops spaced at about 20 yards crouching as a camera swept along the route that John F Kennedy had taken in an open topped car earlier that day. A journey which was to have been his last. 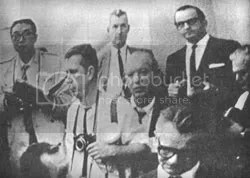 This photograph shows Jack Ruby (nee Rubinstein) attending the press conference held in the Dallas Police Station just hours after the Kennedy assassination – a press conference in which Lee Oswald was paraded as the assassin. Ruby was just a face in the crowd at that time. (He is the man with glasses on the rear right of this photograph). Less than 48 hours after this photograph was taken, Ruby returned to the police station and shot Oswald to death. The picture is a still taken from a piece of moving film – when the film moves on a few frames then another face in the crowd, just a few feet from Ruby, can be seen to be a very young John Ravenscroft, then an unknown Englishman struggling to make ends meet as a labourer in the cotton industry, later to become John Peel, probably the most famous and certainly the most revered English disc jockey of all time. Peel tells the story of how he came to be in the Dallas Police Station on 22 November 1963 in his autobiography, ‘Margrave of the Marshes’ published after his death in 2004. But fascinatingly, he first tells of an occasion in 1961 when he actually met, shook hands and spoke with John F Kennedy, then Senator Kennedy, Presidential candidate. Kennedy noticed that Peel had a camera and invited him to take a picture – this is the picture Peel took (which I’ve lifted straight from the book). Peel was working in Dallas on 22 November 1963, quite near to where the assassination occurred. 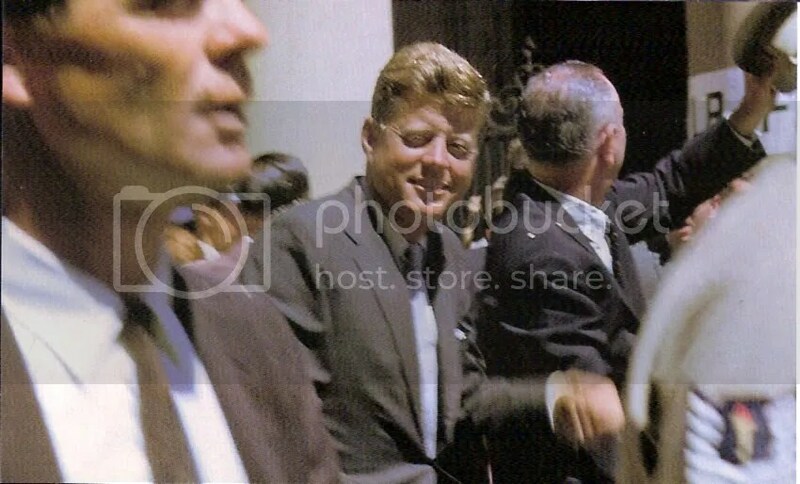 When the news came on the radio he went immediately to the scene and was actually present in the Dealey Plaza area while it was being crawled over by dozens of police and FBI agents in the immediate aftermath of the killing. He seemed to be allowed to wander about on the pretence that he was a reporter from the Liverpool Echo, his accent doing the trick. Later in the evening he went to the Dallas police station, and again using the Liverpool Echo routine, was able to blag his way into the afore-mentioned press conference. When the police brought Oswald into the room, Peel’s impression was that Oswald was genuinely bewildered. “He was either a damn good actor or he was innocent”. Thus John Peel was one of the very few persons (perhaps the only person) to have been within touching distance at one time or another of all 3 major players (Kennedy, Oswald, Ruby) in the crime of the century. This is a reconstructed life sized ‘heid’ of Robert Burns we encountered at Mauchline on Saturday. Going by contemporary descriptions and depictions of Burns, this is not what I imagined at all. This ‘classical’ engraved image of the bard was by John Buego, a friend of Burns in 1787. This image was commissioned for the publication of Burns’s Poems, Chiefly in the Scottish Dialect, published by William Creech that year. It is said that Burns was very pleased with the print and that he wrote to Beugo to congratulate him on it. In a copy of the book given to a friend he wrote the following lines. This image by Archibald Skirving two years after Burns death, bears a striking resemblance to the Buego work. One wonders what Rabbie would have thought of the ‘heid’ in Mauchline? He declared that Hitler was indeed a great man and wrote an article about him in the Daily Express (in 1936) headed ‘The George Washington of Germany’, in which he said that: ‘The idea of a Germany intimidating Europe with a threat that its irresistible army might march across frontiers forms no part in the new vision’, and that ‘the Germans have definitely made up their minds never to quarrel with us again’. He tried to explain away the concentration camps, he declared Mein Kampf to be Germany’s Magna Carta; and even after the declaration of war, in November 1939, he had to be dissuaded from sending Hitler a letter of congratulation following the Fuhrer’s fortuitous escape from an assassination attempt. These comments were made by a prominent British politician of the time. Remembering that George Galloway wasn’t around back then, who do you think it was?